Thread: Why Crypto Exchanges Refuse KYC? When it comes to cryptocurrency regulation, there is a lack of consensus on how to protect investors. Criminal activity such as fraud, hacks and theft is prevalent, not only in the crypto reality, but in the traditional financial world also. Some exchanges have denied Know Your Customer (KYC) and Anti-Money Laundering (AML) compliance, claiming it infringes on the user’s right to privacy. There are a number of crypto exchanges doing everything in their power to avoid having to introduce KYC. These exchanges require no lengthy signup process and no interminable wait for KYC checks to be approved, but such platforms are the exception rather than the rule. For legal and regulatory reasons, exchanges and similar financial organizations within the crypto sector are usually obliged to perform KYC. There is evidence to show that instances of money laundering and other financial crimes are significantly lower in the crypto space than they are in the traditional financial sector. Onerous KYC and AML regulations also serve to deter new entrants, increase compliance costs for crypto companies, and arguably stifle innovation. Rather than deter criminals and increase transparency, some argue that all KYC/AML does is financially exclude those who lack the documentation to prove their identity – a particular problem for the world’s 1.7 billion unbanked. While some exchanges, such as Binance, are famously KYC free, its decision to partner with blockchain forensics firm Chainalysis is evidence that Binance is taking its regulatory obligations seriously. The crypto exchange, the world’s largest by trading volume, is now preparing to introduce KYC for its customers, accordingly to bitcoin.com. KYCbench has developed a GUI friendly and cryptographically secure KYC platform to verify sensitive KYC data businesses, wanting to improve on their existing regulatory compliant KYC processing procedures. KYCbench is built to fulfill the requirements of the GDPR and to comply ISO27001 standard in handling and storing of personal data. 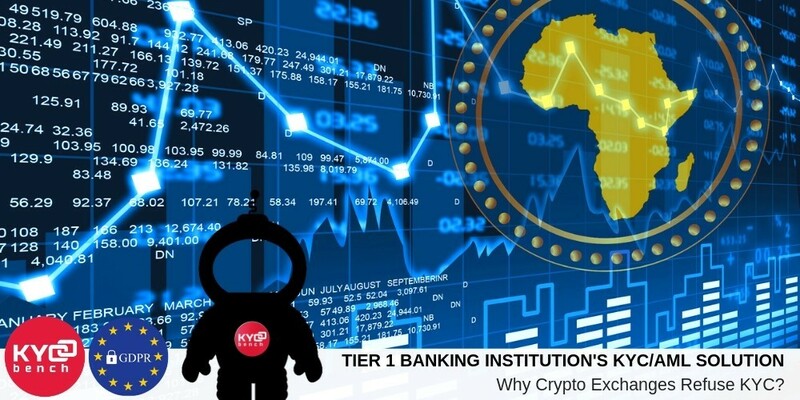 KYCbench works to establish a tailored and customized solution, which would allow KYC processing requirements to be applied with each client, business and startup in the most cost efficient way.